Caretaker foreign Minister Gebran Bassil said Tuesday that the situation of the Palestinian cause continues to deteriorate, mainly with the succession of hits coming from the “deal of the century” or with the silence over it. He stated that the phase of abolishing the right to return and forcing the refugees to remain in the hosting countries in anticipation to their resettlement started with the US decision to cut the funding of the UNRWA. 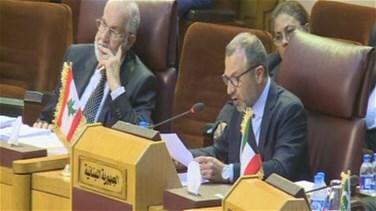 During the urgent meeting for the Arab Foreign Ministers in Cairo, Bassil noted that fragmenting the state aims at abolishing the two-state solution as a foundation for peace, so that there will be no peace, but surrender of the Palestinians and Arabs. “Should we stand idly by or do something to fill the deficit left by the US decision? This is not related to a financial capability, but this is a political, humanitarian and ethical duty,” he added. “I am not a conspiracy theorist, but I am not blind not to see a plan being passed the moment of an Arab weakness, when the winds of change only left destruction and displacement, and I am not mute not to speak out,” he said.